How has eFulfillment Service become such a trusted leader in the eCommerce fulfillment industry? Pretty simple, really….it’s because of our promise to you. 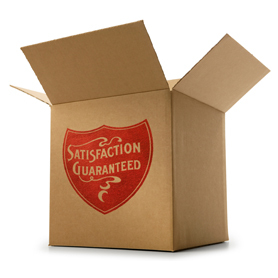 Our 100% Satisfaction Guarantee is our unwavering commitment to rendering outstanding fulfillment services for your business. It is hands-down the best guarantee in the industry, and we keep it straightforward. We’ll get your orders right. If your order isn’t 100% accurate, then we make it right. We will immediately issue a call tag for the incorrect merchandise and quickly send out the right product to your customer. We’ll ship your orders promptly. All orders that we receive are shipped within one business day after receipt. If an expedited order is in by 1:00 PM EST on a business day, it will ship the same day. We’ll honor the prices we quoted you based on the job specs you submit, with no hidden fees and no long-term contract. And you can always cancel your service at any time, without penalty. We’ll respond promptly to your service requests and resolve them to your satisfaction, and we’ll follow-up to make sure we’ve met your expectations. At eFulfillment Service, we fully understand the critical role we play as an extension of your business. And that’s something we don’t take lightly. Discover why we’ve been called the “ultimate choice” in eCommerce order fulfillment. Get a fulfillment quote today.